Tomorrow, November 11, is Veterans Day, and tomorrow I will fly the American flag in front of my house. Not because it’s a political statement but because it’s my way to say thank you to all the veterans who left their homes, their jobs, their families, and their comfortable lives to protect our country. Think about it – young men and women who believed so strongly in America that they were willing to give up a portion of their lives so that we can enjoy freedom. November 11 was originally celebrated as “Armistice Day” in memory of the end of “The Great War.” That’s what they called it – “The Great War” – because their hope, these men who fought in the trenches in France and Germany and all over Europe in 1914-1918, could never conceive that there would ever be another such war. They were wrong, as we know, and so, in 1939, when another multinational conflict erupted, the “Great War” became World War I in order to remember and designate the next horror…World War II. Then, in 1954, the name “Armistice Day” was changed to “Veterans Day” to honor everyone – men and women–who served in all wars and almost every home in my neighborhood displayed the flag. I was young, but I was old enough to remember, during the late 1940’s, another type of flag — the small cloth flags with a blue star that hung in the windows of the houses on my street indicating that a family member was serving in the Armed Forces: Later, sadly, as the war progressed, some of those blue stars became gold when the family was notified that the service man had made the ultimate sacrifice for his country. Our country. On the last day of that war, we kids were exuberant and wanted to celebrate and set off caps and fireworks but my mother hushed us and nodded her head to the house with the drawn curtains and the gold star flag in the window. “Remember them, Connie,” she said…”pay honor to the family.” And that’s what Veterans Day is all about – honoring those who served America. So, tomorrow I’ll hang the flag from the pole next to my door and I’ll remember the veterans — my husband, my brothers, my cousins, all my family members, their friends, and all those brave young men and women who went off to the wars – some to never return – and I’ll silently thank them for protecting our way of life … our country. The characters in my latest novel, STORYTIME AT THE VILLA MARIA, consist of senior citizens – some, World War II veterans, and they tell stories to their friends every Monday night at their senior citizen residential apartment house. They speak of patriotism and heroism and weddings and births and good times and bad and all the things relevant in their lives. These characters remind me of my parents and my parents’ generation. And that’s why I wrote the novel – it’s my love letter, my thanks — to the seniors of the world who went to war, to the wives and families who kept the home fires burning, and to the lives that they lived afterwards. Join them and others as they gather every Monday night in the library at the Villa Maria to share their memories, their fears, and their dreams. 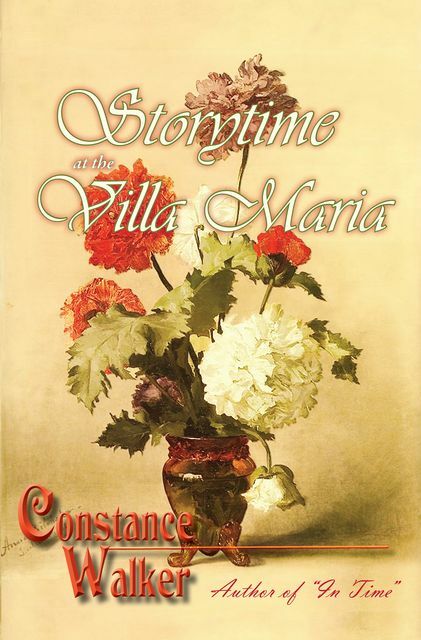 STORYTIME AT THE VILLA MARIA—the unforgettable book about life lived and still to be lived, and about the mysterious threads of joy and heartache and love that are woven into every life—including your own! Constance Walker is the author of THE SHIMMERING STONES OF WINTER’S LIGHT, LOST ROSES OF GANYMEDE HOUSE, IN TIME, and WARM WINTER LOVE among other works of Gothic and contemporary fiction.